KANAN quit film acting in 1959 but continued to be associated with film making as a producer. The films produced by her, mostly based on Sarat Chandra stories anddirected by husband Haridas Bhattacharjee remain assets of the mainstream Bengali cinema. She won several awards,BEST ACTRESS a number of times,she was offered PADMASHREE in 1968-surely she deserved a higher award, the DADASAHEB PHALKE AWARD in 1977, GOLD DISC from The Gramophone Company of India, although she was a Megaphone artiste for most of her singing career. However, above all was the love and respect that she earned for herself from the masses. This remains unsurpassed by any other film personality. One of her major achievements was the formation of the MAHILA SHILPI MAHAL was formed from the felt need that actresses, out of work and easily forgotten by the media and society, should be able to live with honour. 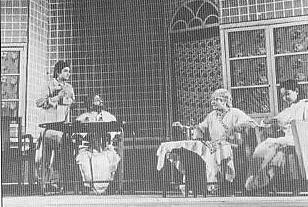 Members of this organization performed stage shows where only female artistes participated .These plays turned out to be extremely popular and KANAN herself acted in some of the plays.The money that was raised was used to buy a house at Garcha Road, Calcutta to provide shelter to those who needed. This was definitely the first of it�s kind and perhaps the only one till date in India. The success of MAHILA SHILPI MAHAL resulted in other organizations coming to her with appeals to provide leadership. The fate of the MAHAL however left her heartbroken-some members got over ambitious with it�s success and tried to occupy thehouse forcefully. KANAN�s failing health could not cope up with these unforeseencomplications and she was forced to disband the MAHAL and sell the house and thefunds were used for social welfare activities.